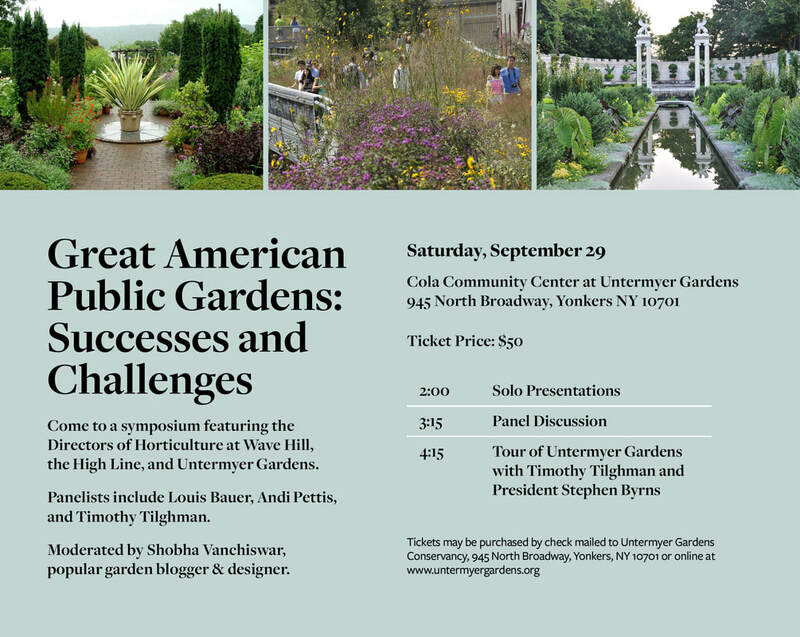 Saturday, September 29 starting at 2 PM, the Great American Public Gardens Symposium will feature presentations by the Directors of Horticulture at Wave Hill, The High Line, and Untermyer Gardens Conservancy. Following the individual presentations, Shobha Vanchiswar, popular garden blogger and designer will moderate a panel discussion including Louis Bauer, Andi Pettis, and Timothy Tilghman. Symposium participants are then invited to tour the gardens with Untermyer Park and Gardens Director of Horticulture Timothy Tilghman and Untermyer Gardens Conservancy president Stephen F. Byrns. Tickets may be purchased online or by check mailed to Untermyer Gardens Conservancy, 945 North Broadway, Yonkers, NY 10701.